Already using Exclaimer Mail Utitilies, the organization needed to update its software in order to continue receiving comprehensive technical support and updates. Upgrading to Signature Manager Exchange Edition gave elka-Holzwerke GmbH the most up-to-date software that Exclaimer has produced to deploy email signatures via Exchange. elka-Holzwerke GmbH is a medium-size timber and wood panels enterprise based in the Rhineland-Palatinate region of Western Germany. Over 200 employees are based in two production sites in Morbach and Kirn, with the organization’s roots being traced back to the beginning of the 20th century. Family-run for three generations, it first opened its doors in 1903 when Ludwig Kuntz, the son of a sawmill owner from Homburg/Saar, decided to rent his own sawmill in Kirn/Nahe. The business venture became a resounding success and new production sites opened in 1908 and 1934. It continued to grow steadily throughout the century, moving into other production areas like window production and parquet flooring. Today, elka-Holzwerke’s wide production range is now focused on the two main areas of timber and panel products. It continues the traditions that it was founded on and has been awarded multiple certifications over the years. All software eventually needs to be upgraded. New products are released with new features and old products cease to be supported. Mail Utilities was no exception. As the software was built to run on Exchange 2007 and 2003, it was no longer appropriate for many businesses who run more up-to-date versions of Exchange. 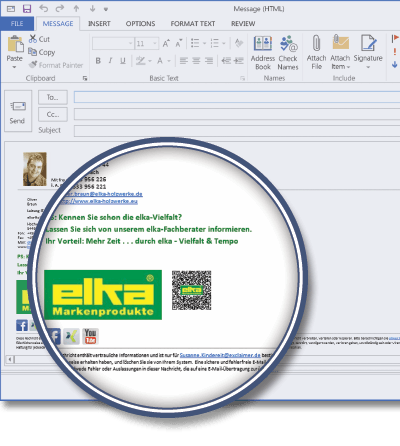 elka-Holzwerke was in the position where it had moved to Exchange 2013, meaning the email signature software that it was using was no longer the best product available to them. Even though the IT department were still happy with the software and the organization had been an Exclaimer customer for a number of years, it was clear it was time to upgrade its software. It was time to move to Signature Manager Exchange Edition. As with any new software, Mr Braun wanted to make sure he was getting the most out of Signature Manager Exchange Edition’s capabilities. Deciding to get some additional support to create the new organizational email signature, he contacted the Exclaimer Technical team, comprised of Microsoft Certified Professionals, who guided him through the whole process via a remote desktop session. This took less than 10 minutes from the initial contact to having the signatures finalized for deployment. As part of a service that is provided to all customers, the level of technical support and customer service offered is one of the many reasons why elka-Holzwerke continues to choose Exclaimer over other competitors. With the latest version of Exclaimer’s award-winning email signature software, elka-Holzwerke can easily deploy signatures to every employee through its Exchange server. Now having the ability to add full HTML email signatures on all devices including mobiles, the organization will continue to have exceptional signatures that focus on the quality of its brand. “Signature Manager Exchange Edition exceeded my expectations in every way,” declared Mr Braun. “Everything runs really smoothly and we continue to be really satisfied with Exclaimer’s software solutions.